With the newly-launched Smart Meetings offer by Pan Pacific Hotels Group (PPHG), meeting organisers get rewarded simply for booking smart. Smart Organisers will enjoy immediate savings of 5% with every meeting booked at Pan Pacific and PARKROYAL properties worldwide, along with a plethora of curated privileges to enhance their meeting experience. In fact being a Smart Organiser has never been more rewarding – with Smart Organisers receiving immediate benefits according to the size of their group – the larger the size, the greater the benefits. The selection of privileges is especially curated with the needs of modern business travellers in mind, including complimentary airport transfers, room upgrades, cocktail receptions, as well as photobooths and tickets to popular attractions – for a meeting experience where every detail is taken care of. At the same time, PPHG understands that Smart Organisers need to be onsite to provide their best for their delegates which is why they will also be rewarded with a complimentary one-night stay before or after their meeting, plus a complimentary room upgrade with Club Lounge access (for any of the rooms booked) throughout their stay for residential packages. Even better, the benefits don’t end when the meeting does. Every Smart Organiser is automatically enrolled in PPHG’s new corporate loyalty programme, Pan Pacific Connections, where they will automatically earn points to access a suite of lifestyle privileges including shopping vouchers and wellness treats. As PPHG’s way of making its Smart Organisers feel truly special, the Group is giving them an additional 3% saving (on top of the existing 5%) for all subsequent bookings across all hotels worldwide within the validity period. 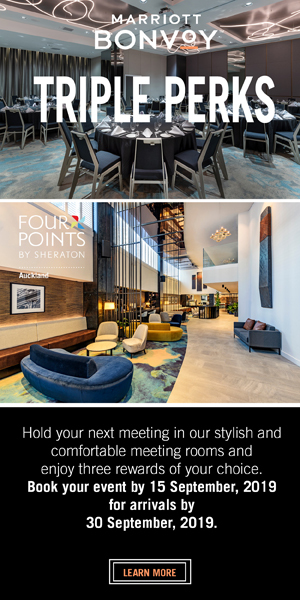 PPHG’s Smart Meetings offer is available at each of PPHG’s five Australian properties – Pan Pacific Perth, Pan Pacific Melbourne, PARKROYAL Darling Harbour, Sydney, PARKROYAL Parramatta and PARKROYAL Melbourne Airport, for residential meeting bookings made until 31 March 2019 and held by 31 December 2019, for a minimum of 10 guest rooms and 15 delegates. Pan Pacific Hotels Group website.